This one is for all the David Cook fans out there – just a preview from tonight's show, with more to follow. If there's one thing that I took away from this show, it's that David Cook is a bona fide rock star – the real deal, no doubt. Stay tuned for the rest of the images! Wow! Awesome! I am glad you enjoyed the show! Wow. Great composition on this, Todd. And who doesn’t love a rockstar wearing a Book-It shirt? Todd, you rock! You are going to make a whole lot of Cook fans happy with these. Thank you for thinking of us and getting this preview out. David has many people under his spell. No better live performer out there today. Beautiful picture of a beautiful man. I can’t wait to see the rest. Todd, you take wonderful concert pics. Thanks for the preview and I look forward to the rest of this self-proclaimed word nerd’s pictures. This nobody certainly loves the rock star wearing a Book-It shirt. Thanks for the preview Todd. Love the t-shirt! I love my Rock Stars to be intelligent. You have the best job in the world. I know you shot the St. Louis show last night; wish I could be at Cook’s Milwaukee show tonight. Also, thanks for your comment. 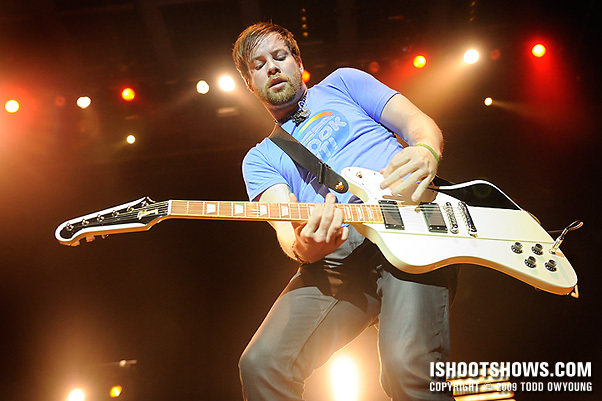 David Cook is undoubtedly a bona fide rock star! Sad to say, sometimes it’s difficult to convince people of this because of their prejudice again American Idol. I’m glad though, that throughout his Declaration Tour, David and his band are proving to the audiences that they’re solid musicians/songwriters. Can’t wait to see the rest of your work! Great picture~! Can’t wait to see the rest! You have the second-best job in the world (first would be the guy behind the guitar and microphone). This first photo is awesome – can’t wait to see the rest. Rock on! Hey all. Wow, thanks so much for the feedback and for the retweets, I really appreciate it. It’s great to hear from so many fans. I’m going to try to post the rest of the photos tonight. I’ve been hearing a lot about this guy. He’s gonna be in my area soon, so is the show worth going to? Nice pic btw. I’m a big DC fan. Awesome shot! I love it! I’m looking forward to seeing more. Fantastic shot! Wow! I love your work. Great shot! I can’t wait to see the rest! Oh, and I LOVE a rock star in a Book It! t-shirt!! I just saw David Cook and his band last night at the Pageant, and it was easily one of the best live shows I’ve seen this year. My wife and I watch American Idol as a guilty pleasure, but were living out of the country during his season so the first time I heard him was when he performed at the Idol finale this year. I thought his voice and emotion was amazing on that song and had heard good things about his musicianship, so we decided to catch the show when he came through St. Louis. I was seriously, seriously impressed, and have to agree with the comment above that he is truly the real deal. Great rock voice, really tight band, and an extremely entertaining stage performer. Count me (and my wife) as new fans. Great photo too! Todd, nice shot of David – can’t wait to see the rest. And as a big fan and supporter of Dave and his band, I’m so glad that you also saw what a great performer he is. Nothing like seeing him live! And a big Whoot! to Ted above. I can’t wait to see your pics. I’ve never really followed a musician as I am David Cook. He is so multi-talented that each day is like Christmas morning, = never know what that boy is going to do to amaze us next. Love HIS songs. Waiting for his to do more Analog Heart-so far he only does Straight Ahead. David Cook World is the happiest place on earth! I’m listening to a cellcast of his show in Milwaukee as I type this. Gah, love him sooo much! Todd, I’m going to click follow on your Twitter to keep up with your work. i’ve really enjoyed looking at your photo collections. Can’t wait to see what you capture with Cook. He’s the man of a thousand faces. this is gorgeous – thanks! Todd, your pictures of The Script from this St. Louis concert are amazing. I expect the David Cook and The Anthemics photos will be as spectacular. You take creative and unusual shots and I will continue to follow your work!